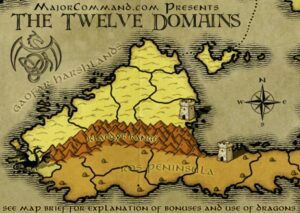 MajCom: New Map: Twelve Domains! Hi, everybody. It’s the Shepherd here and I would like to introduce to you our new map called The Twelve Domains. It is unique conquest map. A conquest map is one on which each player starts with limited started regions. In the case of this map, there are 12 little castles around the map and those are your only starting points. We’re playing a four-player game so we each started with three castles. I am indicated by a little white castle markers. 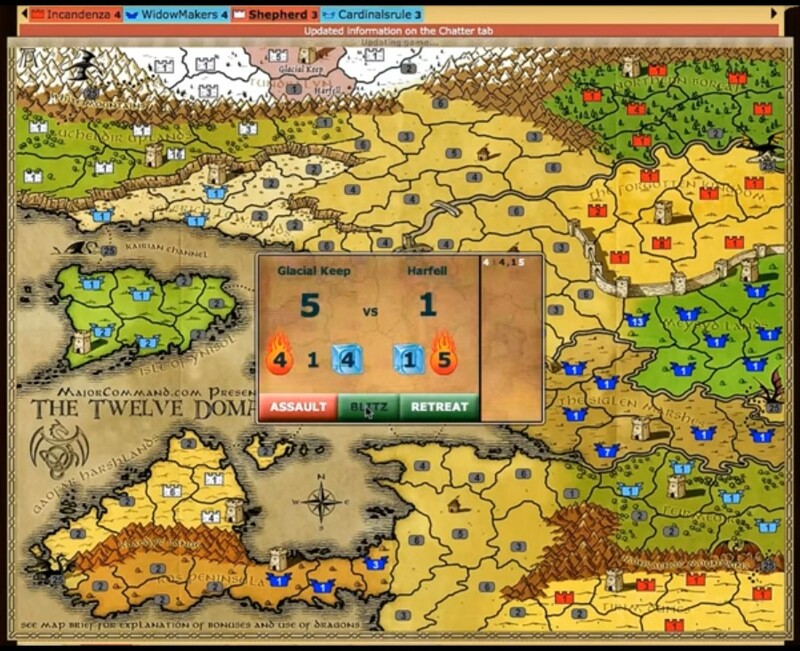 With a conquest map, since you start with limited spaces, everybody is on the same footing to expand out. 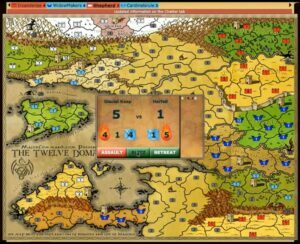 As with any map, you want to start by reading the Brief tab but I’ll walk you through a couple of the basic special bonuses that are on The Twelve Domains. For starters, each castle will start each round with an extra troop and for each other region that you hold within that domain or that color, you’ll get another extra troop. If you look up here, my little castle that’s in the snow in Tundra, we’ll get an extra troop automatically deployed just for itself and then we should get four more. I will begin my turn here. So, my castle jumped up from one to six troops. I got five extras. A couple of extra special moves as well. The castles obviously, to start the game, you’ll want to expand out and take over your domains, so you get your bonuses. 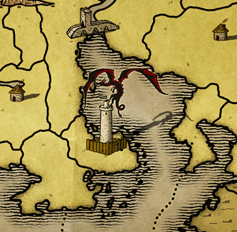 The castles can also bombard non-adjacent regions within their own domain. In the case of this castle here, I can place my armies to start. I will start by bombarding this guy over here now. I’m not taking it over, I’m just bombarding it. I have knocked that down to a one, which means I can then move in and take it over from my other regions. Obviously, one move in, take over as normal and expand out. The other special move that’s on The Twelve Domains is the dragons around the outside. You’ll see there are six dragons. Now, each dragon borders two domains. In the case the dragon up in the mountains, it borders the uplands here – the green area and the white area. I can attack the dragon if I wanted to from either of these two bordering regions, but you can also take over the dragons by holding the tower in the center of The Twelve Domains. If you hold Draig tower, you will take control of any dragon that is nearest one of your castles. If I were to hold the tower, I would take control of this dragon since I hold these two castles, and I would also take control of this dragon since I hold this castle. This dragon up here, since I used to have two castles, would start with a value of 50 troops and this guy down here would start with a value of 25 troops. So, you want to expand out as fast as you can. You do not want to let your enemies take over the dragon because I’ll tell you, that’s some serious [ph] when they come down on you with 50 armies. At the end of your round, the dragons always return to their nest. So they will revert back to neutral at the end of your control of them. 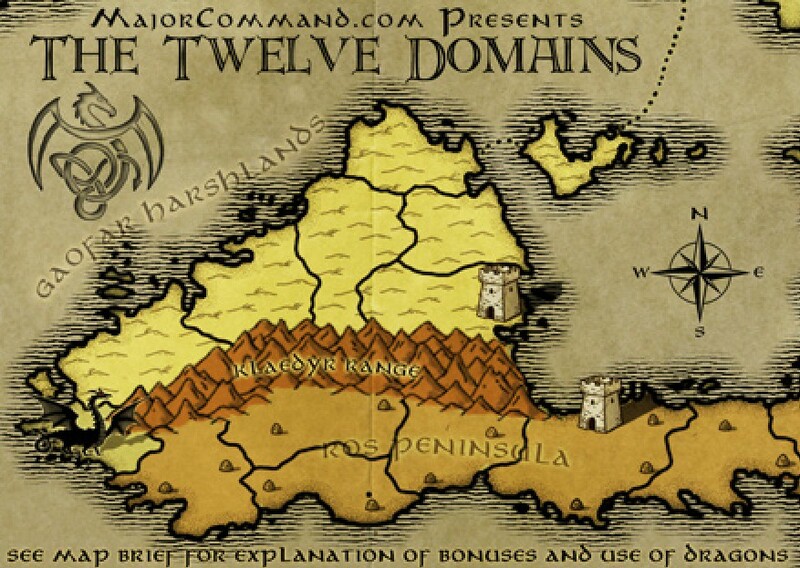 That’s the basics of The Twelve Domains map by Major Command. I will end it there and let you enjoy it.